Jackie Ashley, founder and owner of Shlii, is proud to announce the launch of her Kickstarter project, Norfolk Merdogs: Merpug Cute Plush Toys! In 2013, Jackie created the Norfolk Merdogs line, which is made up of cute mermaid-dogs. “Merpug” is by far the most popular character and is well-loved by fans young and old. In November 2014 Jackie started working with Shinedown Productions, Inc. to create a highly detailed, professionally produced Merpug plush toy. She has collaborated with the production company for the past six months to achieve her vision. Each plush measures ten inches tall, is made with soft, high quality fabric, and is embellished with expertly embroidered details. Plush production is extremely expensive, so Merpug can only be produced with the help of crowdfunding. Kickstarter campaigns are “all or nothing”; if the funding goal is not met Jackie receives no funding, and the Merpug plush will not be produced. Kickstarter enables people from all over the world to bring Merpug to life by backing the project and helping it reach its funding goal of $7,500. 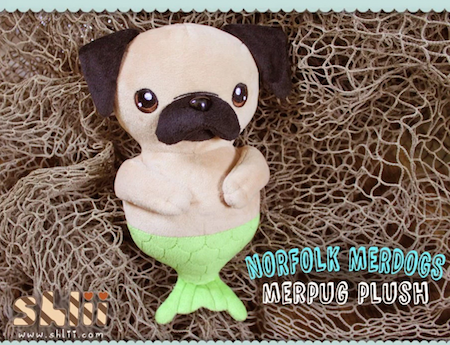 There are several backer rewards available, such as Norfolk Merdogs keychains, vinyl stickers, art prints, and the Merpug designer plush. With the help of many generous Kickstarter backers, the hilarious, absolutely adorable Merpug can be adopted by friends and fans all over the world. Here's a link to the KICKSTARTER PAGE! Aww it's so adorable, I hope it gets funded!